This post may contain affiliate links. For more information please see our Disclosure Policy. Let me introduce you to Pet Treater, a subscription program that treats your dog to yummy goodies and fun new items every month! 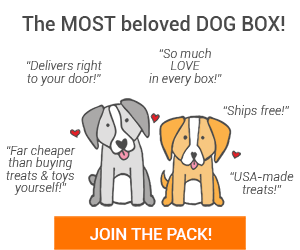 For a limited time, when you sign up you’ll get a FREE dog bed (valued at $20-$40 depending on the size you select) in your first box, too! Make sure you use code UTAH-BED at checkout to get this offer! Pet Treater carefully selects products with the best pricing available, then stuffs a box full of them and sends them to your pet. So you get a fantastic value for your monthly subscription. 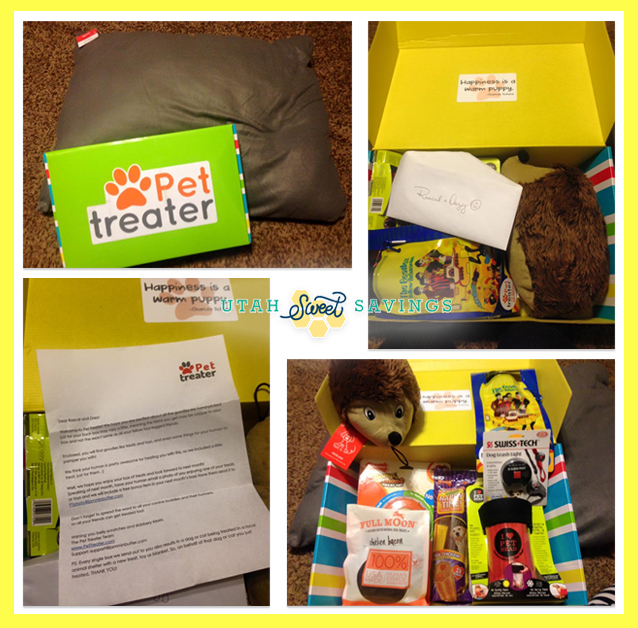 I had the opportunity to review a box, and the box that came was HUGE, since it was filled with a dog bed and so many fun pet goodies! 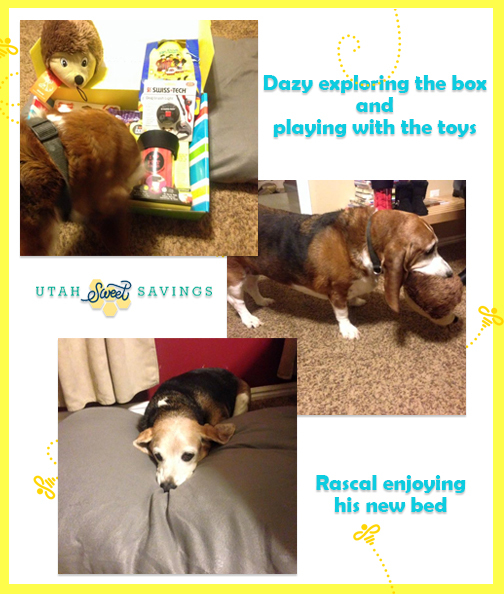 Inside was a note to my dogs, Dazy and Rascal, and a variety of yummy treats and cute toys worth WELL over $24.99. There were also practical items like a safety light to attach to a leash when walking a dog in the dark and a paw cleaner, and even a re-usable water pouch for me! 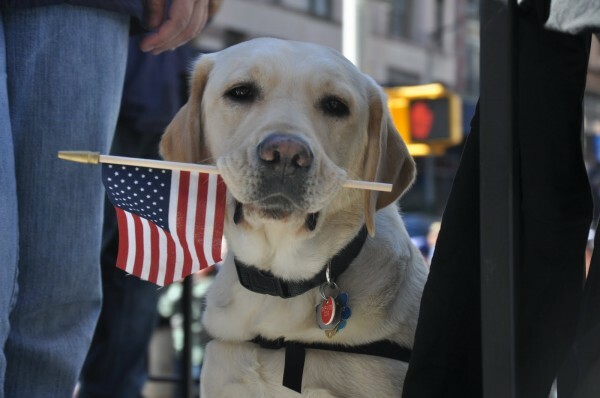 One thing that I really like and wanted to make sure I shared with you, is all their pet treats are made in the USA or Canada. Keep your pets safe! Dazy and Rascal have loved their fun Pet Treat box! Orders placed / billed on the 7th – the 16th of the month ship on the 27th. Orders placed / billed on the 17th – the 26th of the month will ship on the 7th. Orders placed / billed on the 27th – 6th of the month will ship on the 17th. Pet Treater utilizes all methods of shipping available to us including Fedex, UPS, USPS and collaborations. I highly recommend Pet Treat to all dog owners! For $24.99 or less/month on their subscription program, you get an awesome value. If you have multiple dogs, you can even sign up for multiple subscriptions and get multiple FREE dog beds (you’ll get one for each subscription)! Your pups will appreciate not having to share their treats each month, too. Remember to use code UTAH-BED at checkout to get those free beds.